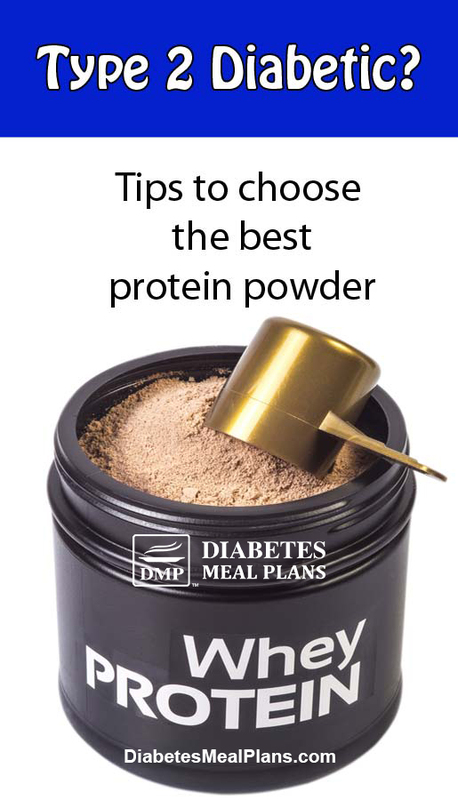 If you're wondering if protein powder fits into a diabetic diet, the answer is yes. Protein powder makes a great addition to baked goods such as cakes. It also makes a great addition to shakes, can be taken as a meal replacement, and even consumed as a liquid snack. But like most foods, all protein powders aren't created equal. Some are poor quality and won't provide health benefits, while others with high quality ingredients can help with weight loss and making foods taste great. And when you're looking for sugar free options, which are a must with diabetes, there are a few extra things to be aware of. It goes without saying that whenever you buy a food that is packaged – always read the label! If a product has an ingredient list as long as your arm or contains many ingredients you can't pronounce or recognize, then it's not a good quality product. Make sure the protein powder you purchase doesn't contain any more that 7-10 ingredients, even less is better. Be sure to check what type of sugar or sweeteners the product uses. Steer clear of products that contain sugar and fructose. And be aware that many protein powders contain artificial sweeteners such as aspartame and these are not good for diabetics to eat, or anyone for that matter. We recommend monk fruit or stevia based protein powders, or second to that, erythritol or xylitol. When a supplement company claims their product is a “proprietary blend” that offers benefits above and beyond other products, don't believe it. Often they won't list the ingredients of their “proprietary blend” on the label, which means you really have no idea what's in the product. Also, when they make claims that certain ingredients are included in their “proprietary blend,” often they are not at a dose that provides any benefit anyway. While there are soy proteins, rice proteins and pea proteins, the best protein powder by far is whey protein, as it contains super high quality amino acids. Whey is one of two proteins found in milk, the other being casein. Interestingly, it's also been shown that eating a small amount of whey protein before meals (50 grams in 8.5 ounces/ 250 mL water), may lower post meal blood sugar levels by as much as 28%. On top of this, a study in the World Journal of Diabetes reports whey protein has been shown to provide a number of additional benefits for type 2 diabetics. Whey protein concentrate contains around 35%-80% protein, and fat, lactose and minerals make up the remainder of it's contents. This type of whey is absorbed at a moderate pace. Whey protein isolate contains 85%-90% protein and very little fat or lactose. This type of whey is more rapidly absorbed and is often the type athletes or body builders take after a workout. But of course, you can consume it anytime. There is a third type of whey called hydrolysate. You generally won't find this type on it's own but in blends. For instance, often all three types – concentrate, isolate, hydrolysate – are combined together in one product. For you as a type 2 diabetic, both concentrate and isolate on their own are fine to consume as overall there is very little difference in the outcome. And if you find quality blends, these are fine, too. As long as you follow all these tips, you should find a good quality protein powder you can feel confident to enjoy. Below we've collected a few that we'd recommend. First up is a great quality product from Bodylogix – grass fed whey, sweetened with stevia and contains no artificial ingredients, colors or flavors. Grass fed means the product comes from grass fed cows and overall that increases the quality of the nutrients it contains. It comes in both vanilla and chocolate. Chocolate ingredients: Protein Blend – 31.05 mg (Whey protein concentrate, whey protein isolate, whey protein hydrolysate) (Bos taurus) (milk). Natural flavors, cocoa powder, soy lecithin, stevia leaf extract, xanthan gum. And like most protein powders it is low carb at just 3 grams per serve with 120 calories and 24 grams protein. Cost for the 1.85 pound tub is under $25, offering 27 serves per tub. 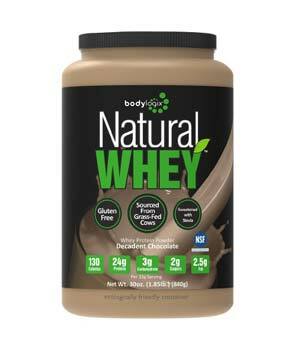 Another great quality product made with grass fed whey and sweetened with stevia. 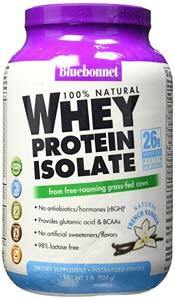 Bluebonnet Nutrition offers both vanilla whey isolate and chocolate whey isolate, along with a dual action protein. For one serve it is 125 calories, 3 grams of carbs and 26 grams of protein. The cost of the tub is $51, offering 28 serves, so around $1.80 per serve. 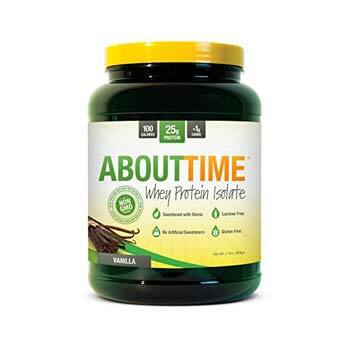 This About Time Whey Protein Isolate product contains just 4 ingredients – whey, stevia, natural flavor and xantham gum. It contains virtually no carbs <1 gram per serve, with 100 calories and 25 grams protein. Cost for a 2 pound tub is $31.79, offering 32 serves per tub. 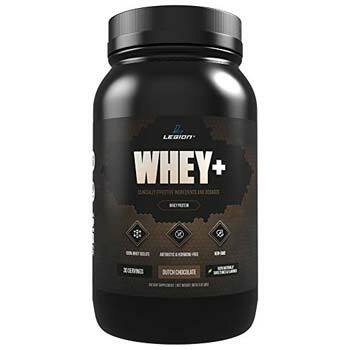 Legion provides another high quality whey isolate protein with just 5 ingredients. Coming in at just 3 grams carbs, 100 calories and 22 grams protein. It costs $37.95 for 30 serves. 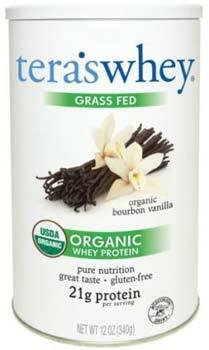 For a fully certified organic product of high quality, go for tera's: Organic Certified Whey Protein. At 4 grams carbs per serve, 110 calories and 21 grams protein, it contains just 4 fully organic ingredients. Being organic, the cost is a little higher at $24.95 for 12 serves. 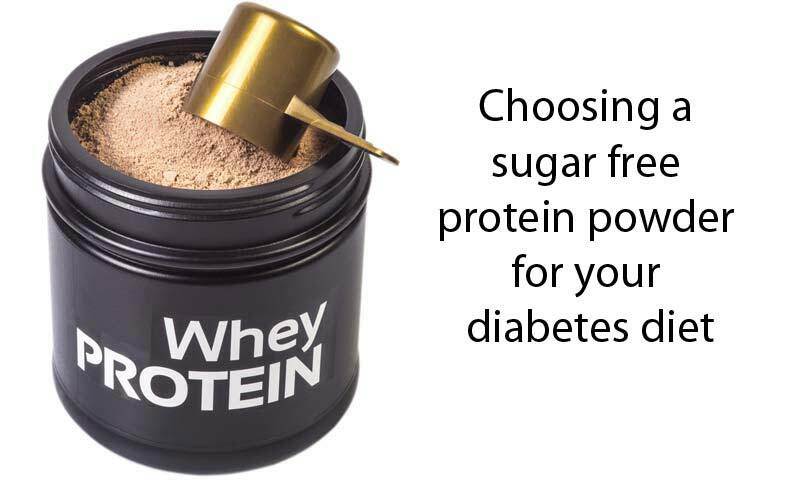 All of the above options are high quality, sugar free protein powders that are perfectly diabetes friendly. You can make a chocolate milkshake by adding chocolate protein powder to it. Add vanilla powder to a delicious berry smoothie. And you can even add protein powder to cakes, muffins and pancakes – like we do in this breakfast cake. And for an amazing snack, make these incredible peanut butter protein balls – which use vanilla protein powder. Please pin, tweet or share this info to help others. For my whey protein shake today, I used BioChem sugar free 100% whey protein with vegetarian Matcha tea. Product from grass fed cows, 90 calories, 1g carb, 85mg sodium, 0.5g fat, whey protein isolate 22g. Hi Jedha, thanks for all your dedication an time for us..I have DBII, is this protein good for me?? Based on the info available to me I see this product contains sucralose. Sucralose is an artificial sweetener and you are better off picking a different protein powder if possible. Pea protein powder is VERY low in carbs. Check out NOW Pea Protein Powder. One serving contains 24 grams of protein and only ONE gram of carbs! I called NOW Foods and was told that this is made using water only, no chemicals and it is non-GMO. Piping Rock also makes a very low carb Pea Protein Powder that contains 16 grams of protein and less than one gram of carbs. It only contains one ingredient – pure, non-GMO pea protein isolate made from yellow peas. Piping Rock uses an enzymatic process to manufacture their pea protein powder. Pea protein powder is very versatile. It has a mild yellow pea flavor which makes it ideal to add to dishes like vegetable soup or chille (vegetarian or meat based). I also like to use it in smoothies. I am a 68 year old long term type two diabetic, drug free with lifestyle only control and I am a vegetarian. What about Garden of life RawOrganic Meal? In general we prefer whey protein products, the RAW Organic Meal Shake is made with pea and brown rice protein. On the plus side, this product is low in sugar, contains no artificial sweetener, and isn’t outrageously high in carbohydrates. If it’s something you already have and have been using without any blood sugar issues then it’s fine to continue using, but you may consider finding a whey based product in the future. If I am lactose intolerant, will the protein powereds you have recommended be ok for me or is there something else you would recommend? As far as I know, Legion is lactose free. How about muscletech Grass fed whey isolate and Mrm all natural whey? Its sweetened with stevia.Are these good quality product ? They both sound promising because they are whey based and sweetened with stevia. I couldn’t find information on the Muscletech product to double check for you, so I recommend checking the total carbs and length of ingredient list as discussed in this article. The MRM All Natural Whey appears like an acceptable product based on the info I gathered from their website. Are any of the recommended powders good for Type 1s? 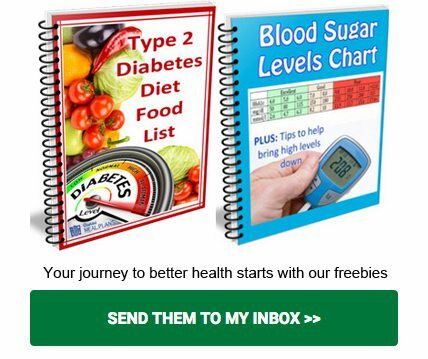 I’ve been a diabetic for 51+ years. My appetite has changed and sometimes I don’t even want to eat. I’m also about 50 pounds overweight. Hi Lori, These protein powders are just generally good quality protein powders overall, so if you were to choose one to make shakes, these would be suitable. Thank you I will buy them. Feel good to gain weight in good way and safe. My son is at risk for Type 2 diabetes nut he also has Ulcerative Colitis. Would any of these protein powders be good for him. He is also allergic to soy and corn. Hi Jill, it’s hard to say 100% as each person reacts differently but the whey isolates are probably the best options to try, and if they are okay, can make a great addition to his diet. 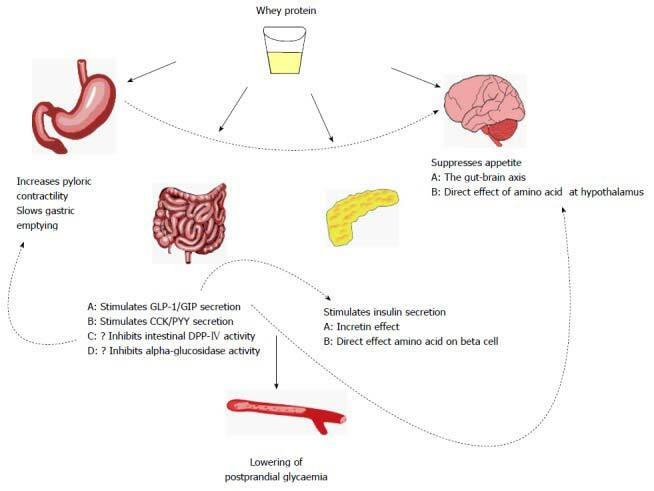 Whey does contain amino acids that can help soothe the gut, so fingers crossed. There are a couple of isolates listed above, or this one by Biochem is good, too. I think i found another good one. It’s called Bluebonnet whey protein isolate. Per scoop, it has 3g total carbs, 26 g of protein, and uses only stevia for sweetening. I think it tastes good too. Yesterday i made a blueberry smoothy with it and my husband (who does not have blood sugar issues) thought it was delicious. Yes Cheryl, thanks for informing us about this one. Definitely a goodie to be added to the list. Hi, what do you think of Spiru-tein? We generally don’t recommend rice or pea proteins because they are usually too high in carbs – the one you speak of has 19 grams of carbs per serve – that’s crazy high for a protein! Hi Jackie, look at the nutrition label, that is the only way to tell if a product is good. Not because a company says so or from front-of-pack marketing tactics or advertising hype. The truth is most protein powders are crap. This one you have is not one we’d recommend either, simply because you don’t need to consume unnecessary ingredients – artificial sweeteners/ sucralose (linked to increased weight gain and diabetes), soy protein (whey is better and ths one you have only contains 12 g protein), it’s also higher in carbs than other proteins 7 grams. Look no one is perfect all the time but if you’re trying to achieve weight loss or use a shake as a meal replacement, you definitely want a high quality one. I purchased EAS Complete Protein Powder which according to the label is quite healthy….is it????? Please let me know before i use it. It’s not one we’d recommend Gloria. It’s quite high in carbs for a protein powder, 14g per serve. That’s because it contains some terrible ingredients – fructose (a bad type of sugar for diabetics), polydextrose, corn maltodextrin (more sugars), and artificial sweeteners – sucralose and acusulfame potassium. All of these ingredients are problematic for diabetics. Try to get a refund so you can purchase one that is better for your health. NEVER trust front-of-pack labeling, NEVER! We are putting together a food label tutorial because people get conned like this all the time and it’s terrible. What do you think about plant based protein powders? I use a brand called Nutiva . Overall that one is pretty good Jane, as all the ingredients are organic and it contains superfoods as well. Just be aware though that compared to whey, it is still a lower quality protein source, as far as bioavailability goes, and the carb count is at least double. Ok, thanks! I didn’t even think about the carb count. I’ll check out some of your recommendations.